InFocus IN5312a review | What Hi-Fi? Since the arrival of 4K in the world of home cinema, Full HD has increasingly become a ‘standard’ specification, so it’s surprising still to see products being made with lower resolutions - especially ones with four-figure price tags. Resolution may put the InFocus a step behind rivals on paper, but it does deliver 6000 lumens – double the measure of brightness of most at this price, so it could be ideal for rooms with a lot of ambient light. The result of that added oomph is an impressively bright picture that gives films a glowing presence. Beam the Killer Joe Blu-ray to the screen and daylight scenes in the Texas trailer park are coherent, though colours aren’t as rich or punchy as we’d like. Lots of brightness is often a trade-off for contrast, and although the InFocus’s contrast ratio is only 2000:1 (the norm is four or five times higher), whites are clean, and blacks have reasonable depth. A fair amount of detail helps make for a watchable picture too, although under closer scrutiny it’s clear that some subtlety is lost here. As expected, the lower resolution produces a less crisp picture than rivals. It can’t render the sharp lines of the Epson EH-TW6600 or BenQ W1500, and some picture noise often creeps in too. Clarity suffers in low-light conditions and dark detail is too easily lost: in a low-lit caravan, furniture in the background is hard to make out, and Matthew McConaughey’s black gloves and cowboy hat lack texture. There’s a hint of motion blur as the camera moves around, but motion is really only an issue in faster, action-packed scenes. 3D glasses are not included with the 5312a, but if you’re willing to spend the extra £60 per pair it won’t go to waste. Though not particularly detailed, 3D picture is coherent enough – it is clear, bright and holds up well with depth and motion. Play Star Wars: Return of the Jedi on DVD and, even though the InFocus has to downscale less than its Full HD rivals, sharpness and definition always come up second best in direct comparison. When it comes to build, the IN5312a is in the ‘large-venue projector’ section of the InFocus website – but it can still have a place in your home cinema set-up, if you have room. Bigger than the majority of its rivals (43cm wide and 34cm deep), this is a hefty machine. InFocus claims it will "fit into a 2x2 foot ceiling tile", for those looking to ceiling-mount it. It’s as solid and heavy (8.6kg) as it looks, although its finish is less of a selling-point: the plastic glossy-black shell is easily marked by fingers, and the tray that slides open to uncover a panel of buttons on the top of the unit is a bit rickety. The buttons aren’t the easiest to get to grips with when using the menus, so we’d stick to the clear, well-labelled remote control, which is thoughtfully designed with bright back-lit buttons and a ridge in the back. The menus are helpfully blown up on-screen, though they are a little problematic in layout. When using a THX Optimizer disc to make necessary image tweaks, we find accessing picture adjustments a little long-winded (along with fine-tuning contrast and colour, we turn off the ‘Brilliant Colour’ mode and put colour temperature to ‘Normal’). Its single HDMI port is less than you get from most rivals, but isn’t disastrous when sources are, typically, plugged into a home cinema amp. Elsewhere, there’s a generous smattering of connections: composite, component, 3.5mm and RCA inputs. Both USB and mini-USB ports are present, but unfortunately they’re solely for power and service, respectively. Ideally you will want a dedicated sound system, but the projector’s two built-in 3W speakers will suffice if they really must. Sitting quite close to the unit, you will find it reaches high enough volumes to hear films above the machine’s fairly loud fan. It’s passable for dialogue-driven scenes, but doesn’t get across the impact of blockbuster action, and particularly loud sounds are distorted at the highest volume. InFocus has been off form recently, and it's hard to see the IN5312a as a turning point. 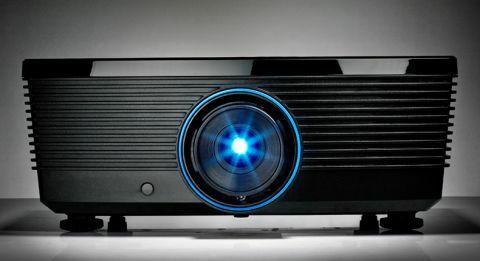 Sub-£1500 projectors may still be considered the budget end of the market, but it’s a hugely competitive field and the IN5312a struggles against more talented and cheaper rivals. Although we can see past its lacking on the specification sheet (fewer HDMI inputs and lower resolution), its flawed performance (lack of detail and sharpness) is harder to let slide.